I made the last cut and got my blocks basted so they are now headed towards the pile of blocks that are ready to be quilted. and one I started many years ago as an experiment. I had some metallic fabric that I wanted to try out and figured it would be the perfect project to try metallic threads on too. It's been a learning experience. Mostly I learned I will never use metallic threads for decorative stitching again. I think I'm going to make a goal of finishing the metallic one in time to put it in this year's CASA auction in November. P.S. The blue & yellow one I was wondering what I should do with is headed to my dad's cousin who was recently in a terrible car accident. I got bored finishing projects I had already started and decided to start a couple of new quilts. The first one is another project using charm squares but this time I'm only doing one cut per charm and I'm putting nine charms together to form a block instead of four. I'm leaving the center charm in each block a solid piece of fabric and I'm going to use that same fabric for the sashing later. I'll try to make some progress and post again in a couple of days. I finished another one! I'm feeling very productive all the sudden! This one is the same as one of the quilts in our book only slightly different fabrics. The one in the book was made by my mother so I wanted to make one myself. 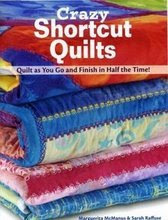 There are seven quilts in the book that my mom made using cuts I haven't tried and I'd like to try them all eventually. I'm having a bit of a dilemma about what to do with this quilt so I thought I'd put my options out there to see what you guys think. Option #1: Give it to an acquaintance who just had a baby (I don't know this person very well, so I'm worried it might be weird if I give her a quilt) Option #2: Put it in the charity quilt auction in November (which will make it a tax write off) #3: Save it for Christmas and give it to an as-of-yet-undecided person on my shopping list or #4: Try to sell it on Etsy. Thoughts? 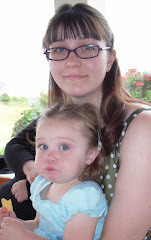 I just got my camera back from the repair shop! I'm so happy to have it home and it arrived right in time to show you the quilt I just finished. It's from my mom's Shortcake pattern which only takes 1 layer cake and 1 yard of fabric for the sashing & binding. It's fast and easy and I think it will be the perfect gift for a little girl I know that is turning 2 in August. This is from a class I took at Seams Like Home about 2 years ago I think. So it's really a newbie to my UFO pile, but quilting a lapsize quilt seemed really appealing after that flannel beast. This pattern is usually called either 1,000 Pyramids or 10,000 Pyramids, I forget which, and has a ton of bias to deal with. It didn't stretch too bad although next time I will use a heavier hand with the starch before I cut my pieces out. And yes, you heard me right, I liked it so much I think I will make another one! Not right away- I'm not ready to give up on my battle against the UFO's- but I am starting to plan. You can sort of see my quilting lines if you look really closely. I did a zig zag pattern following the same angle of the triangles (it reminds me of Charlie Brown's shirt). And for the back I found a really cool varigated striped batik. All the fabrics on the front are batik too. I've decided to give this one to a family member with a birthday in June- I hope she likes blue!